I recently had one of those urges to dig up an old classic and relive some memories when we had a guest over to stay. Worms was one of those games we’d both played when it was new and became instantly hooked. Amazing to think that it was released over a decade ago. At the time of its release, most games needed a bit of memory tinkering to work properly, and although I don’t remember now whether Worms was one of them, getting the game to run under a modern operating system was similarly tricky. To that end I thought I’d write a little guide showing how we managed it. For simplicity we used D-Fend Reloaded, a handy graphical frontend for DOSBox. This emulates the DOS environment that allows Worms to run exactly as it did when it was released. The installation should be pretty straightforward, simply download and run the latest installer package. Depending on your source, the game itself will need to be installed. It may be possible to find this game on abandonware sites, or lurking elsewhere in the tubes, but I’ll assume you have the game on CD. 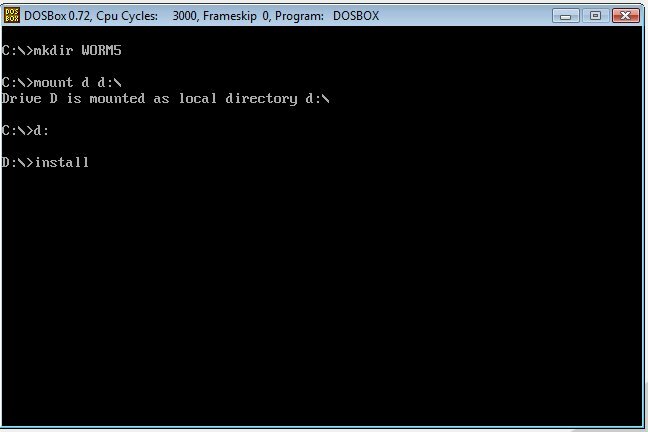 In the window which pops up, double-click the entry “DOSBox DOS”. You should be presented with a classic C:\> DOS prompt. This should run the Worms install programme. Install the game, ensuring to choose C:\WORMS as the installation target. Assuming the previous stage completed successfully, you now only need to set up Worms in D-Fend Reloaded. In the ensuing guide, select DOSBox if it isn’t already highlighted, and click Next. Select the programme to be run (normally .\VirtualHD\WORMS\WORMS.BAT) and optionally the setup programme (this will depend on your version of the game) and click Next. The programme should automatically choose a template that matches your game (either Worms or Worms Plus). If this isn’t the case, you can choose one of these templates from under the Use user-defined auto setup template list. Click Next. The next screen simply contains details of the game and how it will be displayed in the D-Fend menu. Alter these if you wish, otherwise click Next. The final screen should list the drives mounted by DOSBox when the game is run. 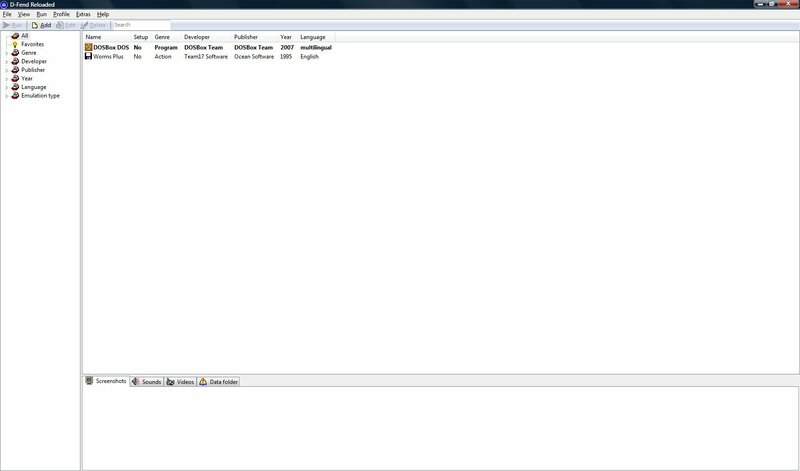 Currently this should only include .\VirtualHD as the C drive, but we also need to mount the CD. Click Add… and in the following window change the Type to CD-drive and select the root of your optical drive as the Folder for mounting. The Drive letter should be D and the Label can be WORMS or anything else for that matter. Click Ok.
Before closing this wizard, tick the box labelled Open profile editor when wizard closes, and then click Ok.
For some reason, the sound is disabled by default, so in this final menu, we need to select Sound and then tick the box Activate sound. Click Ok. There should now be a second entry in the D-Fend menu in addition to DOSBox, which should run the game in virtually all its former glory! We still ran into a few problems with our version, namely that the intro FMV sequence had to be skipped (by pressing S when prompted) and the few little FMV sequences in the game itself ran extremely jerkily, and were better off being by-passed altogether (pressing Escape). More disappointingly, the CD music refused to play, an ingredient sorely missed! Otherwise, the game failed to disappoint any of those expectations heaped upon us by nostalgia. Idid everything the guide told me to do and all looked good untill the moment i pressed “s”.. 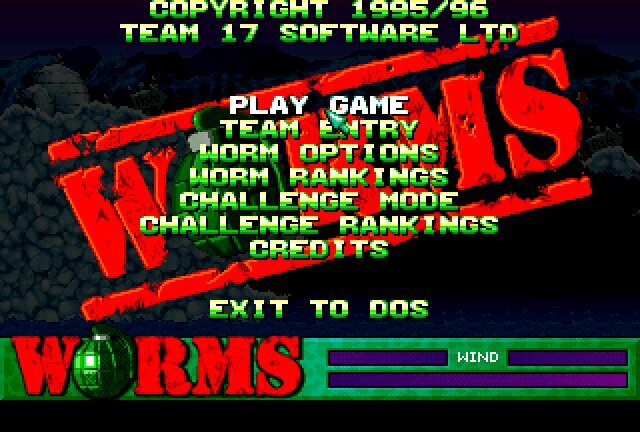 The game suts down immediatly and it says in dos that C:\WORMS\BIN.EXE and C:\WORMS\BIN\WMRS are illegal commands!?!? Does anybody have an explanation or solution for this?